Right now my skin is in a bit of a mess. Although it's always been bad acne-wise, it's recently got to a point where I'm finding it almost impossible to hide my spots, which can be pretty disheartening. 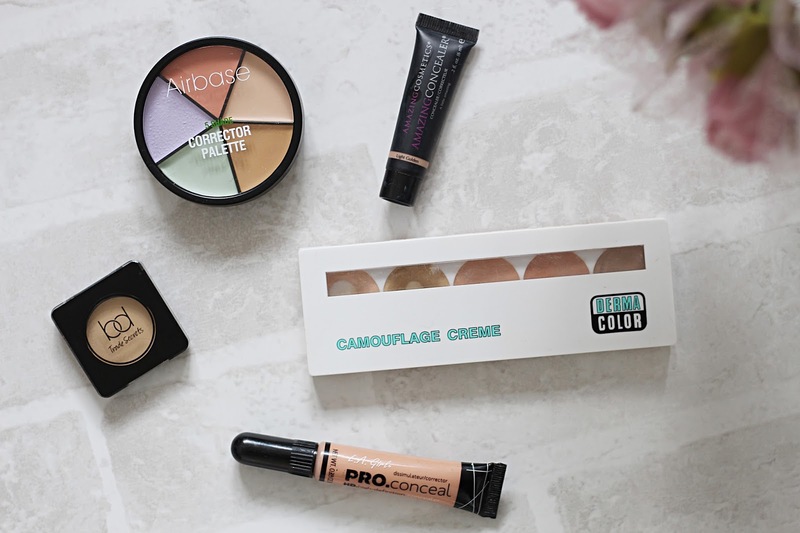 I've been trying a lot of different concealers recently in the hope that I'll find one that delivers the coverage I need, so I thought it made sense to put a little post together on the current concealers I've been trying. A concealer I have been reaching for on a daily basis is the Dermacolor Camouflage Creme palette from Kryolan. With five super thick, full-coverage shades, I've found this palette to be amazing at covering up my spots prior to applying foundation. A little bit goes a really long way, and I like that the concealer is quite dry as opposed to creamy, as it means it stays in place all day and doesn't add any oil to my already oily skin. Granted, I only really use two of the shades in the palette, as three of the five are quite pink-based, but the shades I do use work perfectly for me. If you're looking for super creamy, full-coverage concealers, then look no further than the Amazing Cosmetics Amazing Concealer* and the Barbara Daly Creamy Concealer. Both are extremely thick, full-coverage concealers that deliver incredible coverage and blend with the skin beautifully. As they're so creamy, they obviously need setting with powder, but aside from that you can pop these on and they're good to go. They work well both under and over foundation, and the only difference between the two really is that the Amazing Concealer is fuller coverage and is in a liquid format, with the tiniest bit going such a long way, whereas the Barbara Daly offering is a solid concealer and you definitely need to use more. They are by far the best creamy concealers I've ever tried. I'm really into rainbow concealers - you know, green for getting rid of redness, yellow for any purple/dark circles, and lilac for sallow/yellow skin. The Airbase Corrector Palette* has two generic concealer shades, one terracotta shade, one lilac and one green. I'll be honest, I had high hopes for this palette and was a bit disappointed - for the hefty price, it's not that great. The consistency of the colour concealers is really difficult to work with, as they are quite chalky, tacky and difficult to blend. On the other hand, the normal concealer shades are extremely transparent with hardly any coverage at all - not great when you need them for concealing! I've definitely tried better coloured concealers, and would definitely prefer my inexpensive W7 green concealer over the one in this palette. I'm a big fan of the L.A. Girl Pro Concealer - I use the bronze shade for contouring and find it blends beautifully and a little bit really goes a long way. Whilst the coverage isn't anywhere near as good as the creamy concealers, this concealer gives a dewy medium coverage that feels a lot lighter on the skin, making it ideal for the summer months. The only downside to this concealer is that it does tend to crease under the eyes, but other than that I'm definitely a fan - just probably more for contouring/highlighting than concealing spots. It's an amazing price too. So there you have it... the concealers I'm currently trying. What is your favourite concealer at the moment? Let me know!